pretty much it’s the balm on the far end of harried days. it’s what happens when you start to lose the dinner hour. when trains run late, or deadlines detonate the time clock that was your chopped-seared-and-plated two-course hope. when coaches call a practice smack dab at chow time. when sweaty gyms take the place of civilized dining chambers. it’s the plate that waits, gosh darn it, that stands up to any threat to steal away that modicum of grace, of communion, at the end of a long day. it’s the ceramic plane, piled with foodstuffs, that tells you, worry not, we bend here to what you need. 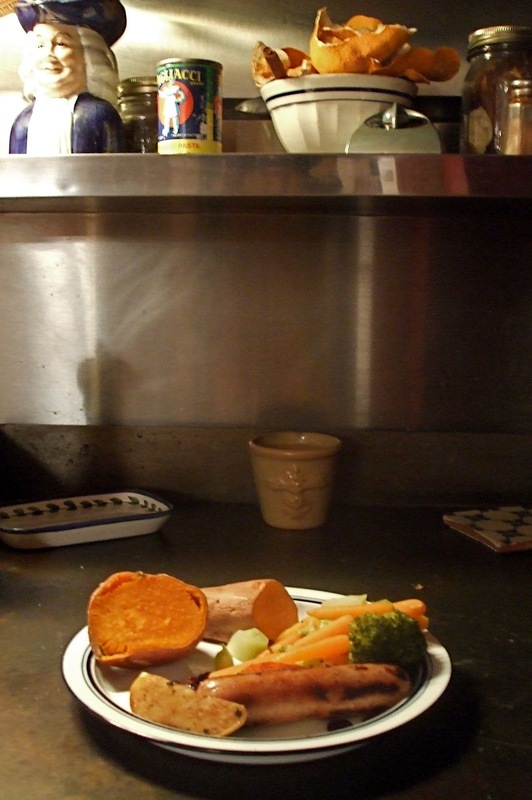 we won’t leave you to fend alone in the cold dark kitchen. we’ll extend the dinner hour, late as you need it to be. in this house, you will be fed, and fed as if you were right here among us at the noisy dinner table. we did not forget you, as we piled high the plates, put out the napkins, clasped hands in simple ad-hoc prayer. it’s the late-plate, all right, a dish i long ago came to know, came to count on. for weeks on end, way back in high school, i remember coming in the house, soggy wet from hours in the pool, and knowing where to look, under the stove light, the one that burned late into the night, shining spotlight on a plate of sensible sustenance, my mother’s forte, my mother’s gift to me. i learned, as so many do, at the hand of my mama. learned what it feels like to be fed, to sit down hours after all the others, sink your fork into a baked potato, slice a chop, impale a pea, because whoever did the dishing up that night didn’t fail to think of you. to want to feed you. to leave a warmed-up calling card. and so now, it’s my turn. i’m the mama of a boy who just this week has set his oars in the water, took up crew, a lovely sport, a sport that sets you sailing down smooth channels, a sport that makes you hear a soundtrack in your head, some english sort of rowing melody, chariots of fire, perhaps, phillip glass (i know the latter because i hear the dissonance pounding through the speakers as the fledgling rower mimics all the pulling through the waves, only on dry land, down in the basement, where so far at least, it’s a space without a current). seems the crew team strokes daily till 8 bells, night bells, and so the sweating mass of muscle and newfound sport, bounds through the door near half past that hour, and finds i’ve left for him a circle of sustenance, just like my mama did for me. the age-old rite continues: i’ll leave you a plate; dinner will be waiting; it’ll be under foil, in the oven, on the stovetop, in the fridge. somewhere, you who i love, who i tend body and soul, there will be fuel for the end of your day. food to fill you. and, as it’s always been in these kitchen matters, there will be a good measure of love stirred in, for there is rarely a recipe worth its cups and measures that does not behold an equal mix of passion. we cook to love, many of us. even if we don’t always love to cook. it is, more than most domestic arts, a telegraph of pure affection. one that stands a chance of registering as such. can’t say my heart is swooning as i dust the silt off the bedside table in my messy boy’s room, or as i wipe down the toilet seat of boys who, well, must not pay close attention to the target. but in leaving a simple plate of sauteed apple slices, sprinkled with cinnamon, dried cranberries, bathed in just a dab of butter, a sausage grilled, sweet potato bursting earthy sunset-orange, i am whispering in that tall boy’s ear. saying, you deserve more than cold deli turkey, more than spoon of peanut butter, more than power bar. shining there, under the 40-watt bulb that illuminates the stovetop, that plate says clearly: welcome home. sweet heart, day’s not done till you are here among us. till you’re fed, sated, full again. day’s not done till we’ve met you with the truth that here, on our watch, you will always be tended to. we won’t send you off to bed, wanting. what messages do you signal from your stovetop? or do you tap out lovenotes in other keys? Wow! Thanks for stirring my heart with memories of coming home late weekday nights after sports practice (in high school) to a sumptuous home cooked repast, I’m talking a generous square waiting for me in the kitchen. Wow! I could feel Mom’s love in my tum tum. Yum yum. that is something college students miss for sure… it’s hard sometimes to have to fix your own plate every night. on the other hand, the independence is exciting too… planning my meals, grocery shopping, and cooking all keep me grounded while i am dealing with academic difficulties and culture shock.on a side note, i might be able to witness the famous oxford and cambridge boat race while i am here in london. so, yes, rowing is a very english thing to do, and i applaud it. When the boys were younger, yes, there was always a late plate or three at my house. Now the late plate food generally gets moved into microwave dishes and becomes tomorrow’s lunch. My issue is that it’s hard to cook for only a few after years of cooking for many. Either way, the message is still there – this is something for you from me. We cook to love! How perfectly, truly, simple and beautiful.